We’re going deep inside the making of a book, with interviews from Penguin Random House employees in editorial, marketing, sales, and more. If you’ve ever wondered about all the behind-the-scenes work that goes into making your favorite books, this is the series for you. Take a look at the first post in this series here. This is part 2 of our round-table discussion with the digital marketing team. For part 1, click here. Describe Gemina in one sentence. Kate: “Fast-paced page-turner” Cayla: “I don’t know what’s faster – whether it’s your heart racing when you’re reading it, or how fast you’re turning the pages” Stephanie, what was the best part of making the website? Stephanie: One of the interesting parts about this website project is that we weren’t coming to it with a clean slate; a website already existed for the first book in the series, Illuminae. 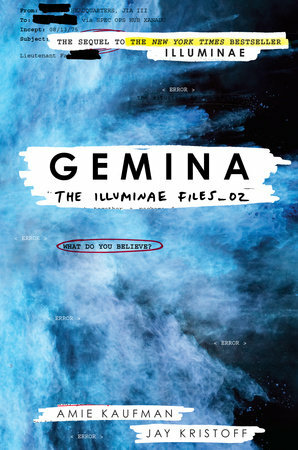 Therefore, when planning the website for Gemina, we really had to look at the Illuminae Files website and see how we could update it to work for both books. We did a full redesign to incorporate the new blue elements from the Gemina book cover, and we developed a plan for exclusive content we can bring to the website. You really want to make sure that a website is an ongoing part of a campaign to ensure that users have a reason to come back to your site, and we’re really excited about all the great content we have planned for this site. Cayla: Yeah, the website is something you’re going to want to keep your eye on. A really cool sweeps we had a couple months ago let people enter for a chance to have their name on the casualty list in Gemina, and the excitement around that was really cool. We’re going deep inside the making of a book, with interviews from Penguin Random House employees in editorial, marketing, sales, and more. If you’ve ever wondered about all the behind-the-scenes work that goes into making your favorite books, this is the series for you. Take a look at the first post in this series here. Gemina is a very unique book, so our employees need to be big-thinking and creative. We sat down for a round-table discussion with the digital marketing team at Random House Kids to find out exactly what they do to support a book. Please introduce yourselves and explain your work in this group: I’m Stephanie McKinley, Technical Producer at Random House Children’s, which means that I handle all of the technical projects for the digital marketing team. Before I started, all technical projects—even a copy edit on a website—were completed by outside developers. Now that I am here, we’ve been able to bring a lot of these projects in-house. The Illuminae Files website is one of the projects that was initially created by an outside developer that I have since updated for Gemina. I’m Cayla Rasi, Senior Digital Marketing Manager. My job here is to dive into our digital projects – I work closely with Stephanie and our Director, Kate. I do a lot of social: Facebook, Twitter, Instagram, you name it. We’re always thinking of really cool ways to reach our readers. 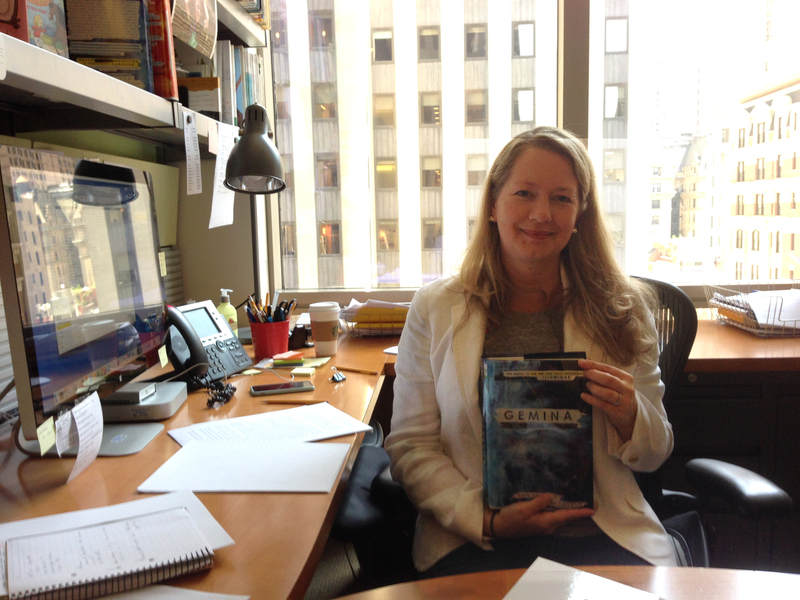 I’m Kate Keating – director of Digital Marketing here at Random House Kids. I oversee the department, and we basically touch everything digital. Email marketing, websites, social media, we oversee all digital strategy for the department. What do you think is special or unique about this book? Why will readers want to get their hands on it? 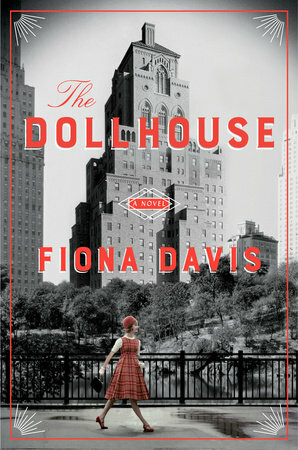 Stephanie: The book is just so different in the way that it’s written. With all the art elements inside, it’s just a completely different reading experience than anything you’re used to. Cayla: Of course, it’s the format- It’s just so wild, it’s so cool. But from a social media perspective, the most special part about this book is the authors. They are so engaging, they love their fans, and they’re kind, generous people. Their social presence is magnificent, and they’re so fun! You can’t help but fall in love with them and their book. For people who aren’t following them on Instagram and Twitter – you’ve got to. Their personalities just shine. Kate: Well, It’s not like any other book I’ve seen, especially for this audience, and people are so hungry for the second book after reading Illuminae. I love how into the characters everyone is… they feel really connected to them. I love that the authors are willing to do anything and they understand social media… they really get it. Everyone in-house is saying it’s the book for people who don’t necessarily know they like sci-fi. 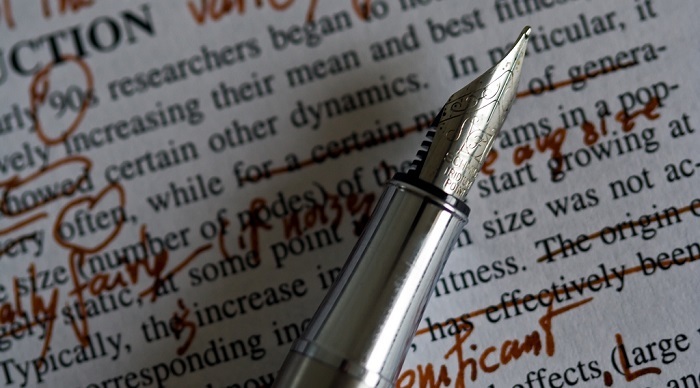 What are some of the steps you take when you first start working on a title? Cayla: I start by reading the book. I find inspiration from between the pages. Then, I love looking at the fans and what they’re saying online. The fans give me that fire in the belly, they get me excited to work on a project: I love being able to see what they are talking about, what matters the most to them. Kate: Our marketing process starts with list launch meetings, when the editorial group presents all their titles for that season. Later on, we have meetings with publicity, editorial, sales, and marketing groups. We talk about comparative books in the marketplace, and how we felt about our readings of the book. Afterwards, we create slide presentations to flesh out ideas for a marketing campaign – at this stage, it’s still loose and flexible. The next round of big meetings is called pre-sales: that’s when we present our ideas to the field sales representatives and our president. They give us feedback, and we tweak our plans accordingly. We also have author meetings to figure out challenges they’ve faced in the past, or things that have worked well for them before. Next up is sales conference – at that point, everything need to be pretty finalized because editors have to send final concrete marketing/publicity/sales plans to the authors and agent. A big part of our team’s work is prioritizing tasks, because the digital landscape changes so quickly. Sometimes we may have a whole plan that we’re starting to execute, but will suddenly need to do finish is much faster than anticipated. We try to plan as much as possible, but we do have to react to things quickly. 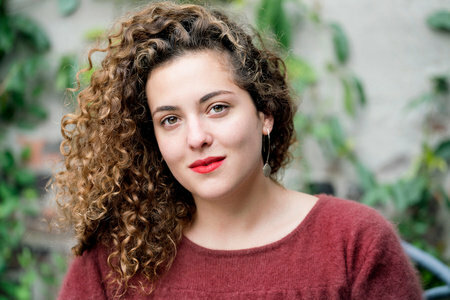 Cayla: Social changes all the time – so we make plans, but there’s also so much shifting and changing so we have to stay very creative and nimble. But really it’s a matter of being able to do both: plan in advance and also work in real time. 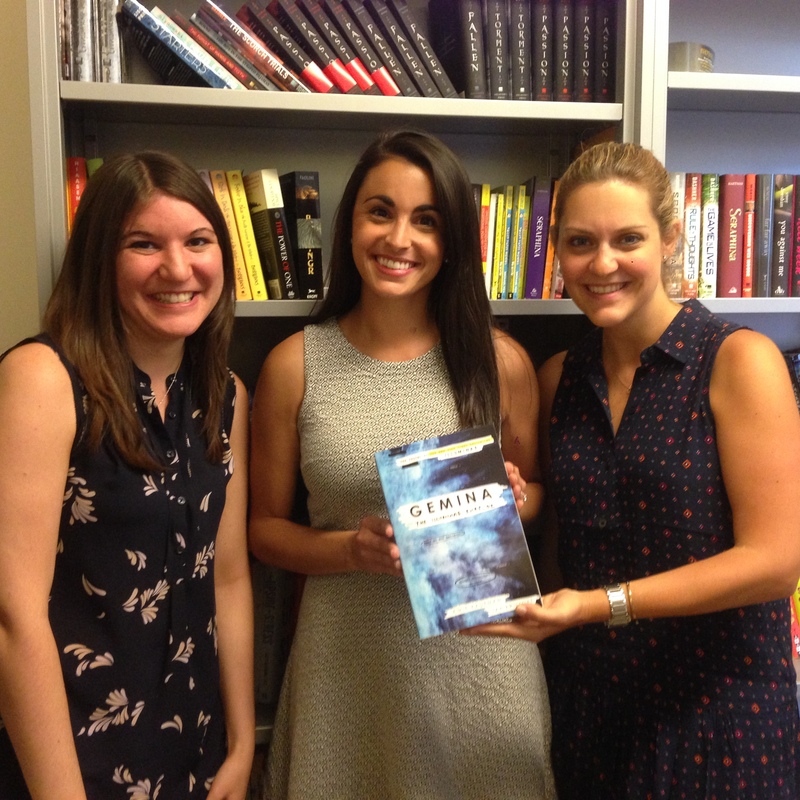 Check back in the coming weeks for the inside scoop from the Gemina team! 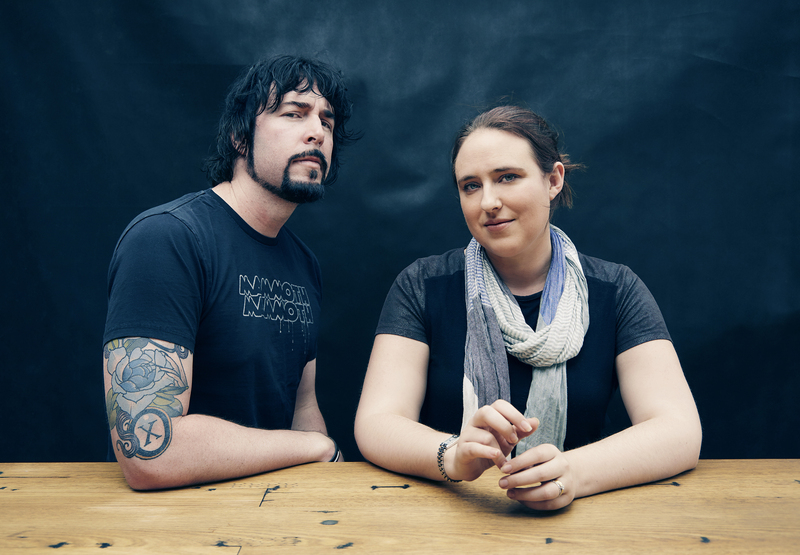 Follow along: #Gemina, #Illuminae, #IluminaeFiles Follow the authors on Twitter (@AmieKaufman, @misterkristoff) and Instagram (@amiekaufmanauthor, @misterkristoff) Visit the website here: illuminaefiles.com Read more about Gemina and Illuminae below. 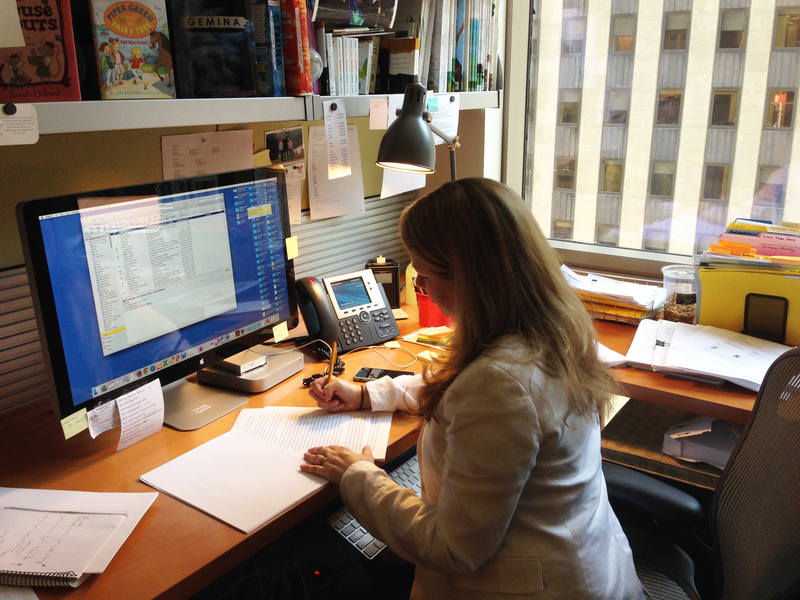 Ever wonder how a book makes it from the author’s mind to a reader’s shelf? Last time we delved deep into a book, we focused on the fascinating But What If We’re Wrong? by Chuck Klosterman. You can explore that series here. This time, we’re taking a sharp left turn with one of the most exciting and nontraditional series on the market. The second book in The Illuminae Files, Gemina by Amie Kaufman and Jay Kristoff, has been hotly anticipated by fans ever since Illuminae ripped onto the scene last fall. Full of spaceships, evil corporations, and deadly viruses, the plot is heart-pounding. However, it’s the format and design of this series that really makes it stand out – no one page is like the next. It’s a collection of files, announcements, data, memos, text messages, photos, and illustrations, all meshed together to give the reader an experience like no other. Gemina is set to be even more jaw-dropping, so follow along to discover the hard work and inspiration that goes into the making of this unique book. In the coming months, we’ll talk to the editor, marketing team, a sales representative, and other people who help make a book… a book. 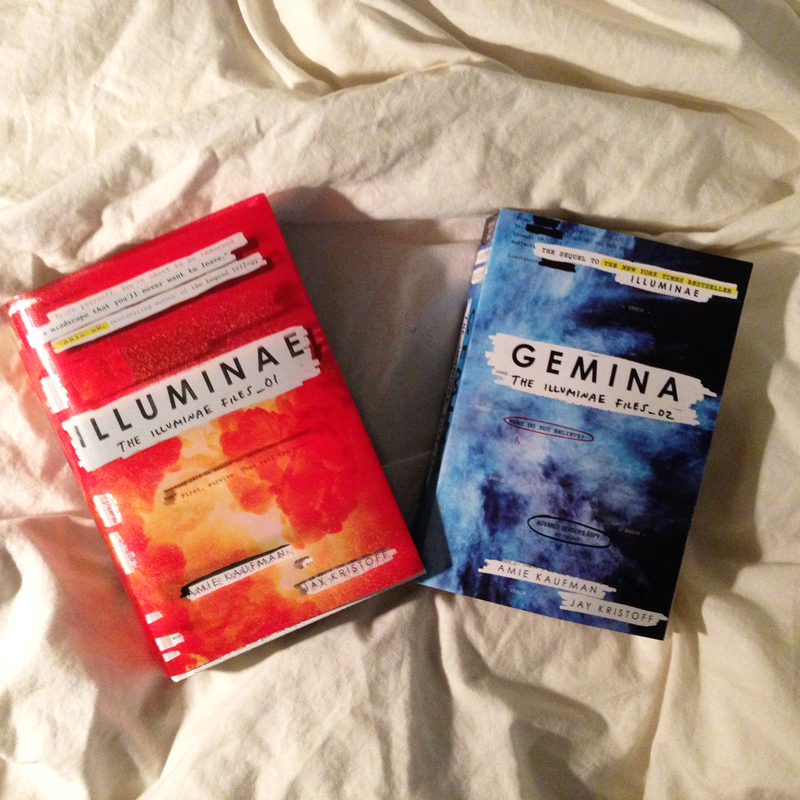 Read more about Gemina and Illuminae below. Kamm, who writes about grammar and usage for the London Times, calls himself a ‘recovering pedant’ who believes much of our insistence on set rules for English is really a cover for snobbery and exclusivism. Yet he is not above correcting others who have written similar books, especially the sticklers, who, he claims, “are confused about what grammar is,” (and who would probably suggest he rephrase his sentence so as not to end with the prepositional-sounding ‘is’). Grammar, he points out, refers to syntax, morphology (the way words are formed), and phonology (the way words sound). Sticklers, he writes, often confuse grammar for orthology (spelling and punctuation). Whenever one of these purists publishes a book, armchair grammarians (and orthologists) take great glee in pointing out the errors in the text (many of which, to be fair, are merely typos that slipped past the eye of wearied copyeditors). To figure out which side of the great debate you fall on (if you think that sentence should read, ‘to figure out upon which side you fall,’ you already know the answer), check out these other guides to the confounding, complicated, and fascinating language known as modern English. Eats, Shoots and Leaves by Lynne Truss Truss, the author of several guides to punctuation, comes down firmly on the side of the sticklers (and earns Kamm’s wrath for her punctiliousness). 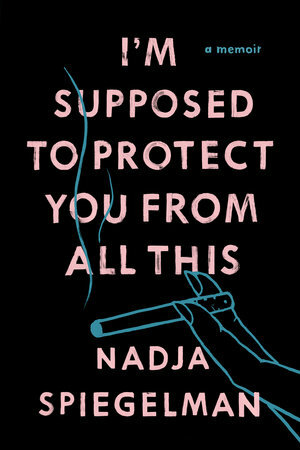 As the title of her book proves, a misplaced or missing comma (or apostrophe, or hyphen) radically alters the meaning of sentences, turning the dietary habits of a panda bear into a description of a gun-bearing mammal who dines, opens fire, then departs. Between You and Me by Mary Norris The New Yorker is as famous for its exacting copyediting process as it is for the peccadillos of certain editors such as William Shawn, who forbade words including ‘workaholic,’ ‘balding,’ and ‘urinal.’ This memoir by Norris, who has worked at the magazine since 1978, was an unlikely hit, and spawned an online video series where she reveals the grammar errors she’s found in writers’ drafts, and describes not just why they’re wrong, but how to fix them. Elements of Style (Illustrated) by William Strunk, Jr., E.B. White, and Maira Kalman If grammar has a Bible, it is this book. First published in 1918, when the world was in need of some solid, straightforward guidance, this book remains beloved for its no-nonsense tone and unapologetic belief that the rules of grammar do exist, and are actually quite easy to follow, if you just pay attention when you speak and write. This edition, lovingly illustrated by Maira Kalman, injects the book with a playful visual guide to the etiquette of proper sentence construction. Yes, I Could Care Less by Bill Walsh The problem with the way most of us speak and write, the author of this book contends, is we forget to consult our brains. A longtime copyeditor for the Washington Post, Walsh is happy to hold the unpopular opinion that there is a right and wrong way to use words, and it actually matters if we say ‘literally’ when we mean ‘figuratively’ or claim we ‘could care less’ when in fact we mean the opposite. Walsh himself cares, quite a bit, and isn’t afraid to stand up for what he believes.